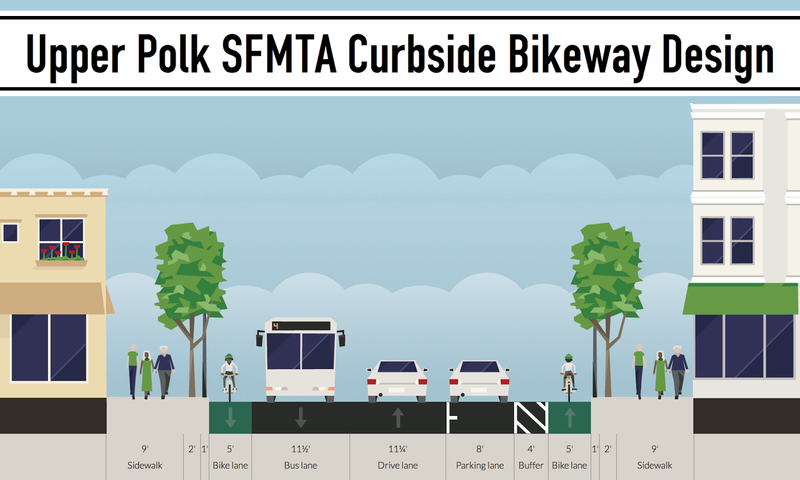 Following last week's analysis of Polk Street and cycle tracks, I've looked deeper into the bikeways originally proposed by the SFMTA to find out what was actually considered and what is geometrically feasible. I also looked at the parking issue to determine how many parking spaces would really be removed if a cycle track were installed. 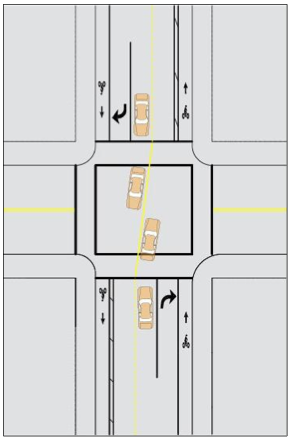 Based on my research, it would appear that Polk Street's geometry could support two buffered bike lanes (a.k.a. cycle tracks) with parking on one side. Based on my parking analysis, such a scenario would require removing roughly 50% of Polk Street on-street parking. 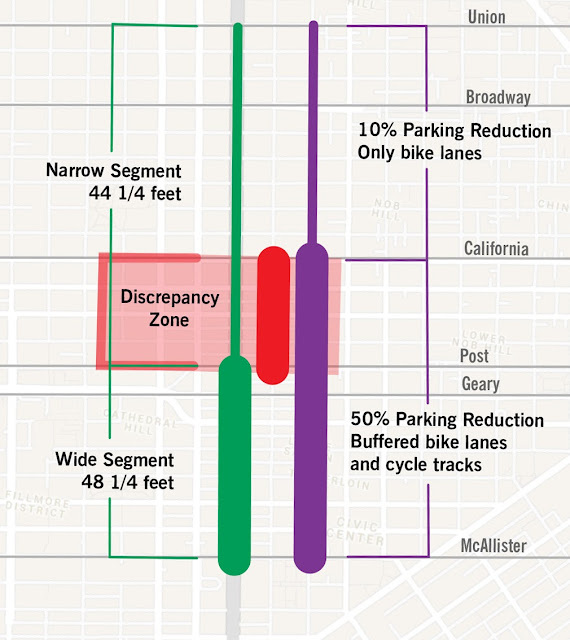 The SFMTA has proposed a modified geometry that removes 50% of parking, but only between California and McAllister. Although the street is narrower curb-to-curb from Post to Union, it's only from California to Post that the SFMTA is proposing removing 50% of parking. Parking is reduced 10% north of California and 50% south of California, yet the street are narrower north of Post, not California, and wider south of Post. Image: Urban Life Signs using Google Maps base map. For some reason, one which their explanations do not fully explain, only 10% of on-street spaces will be removed on Polk Street from California north to Union Street. Incidentally, this part of Polk serves as a commercial corridor for Nob Hill and Russian Hill. 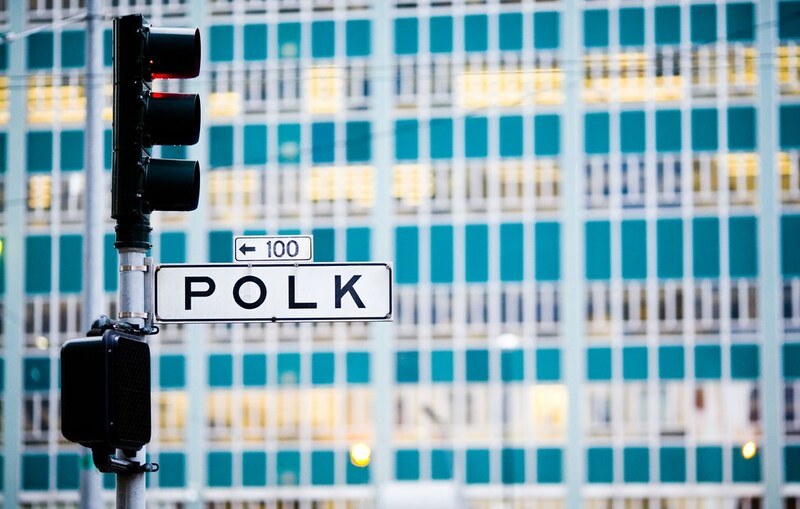 South of the parking preservation zone, Polk passes through Polk Gulch/Lower Nob Hill, the Tenderloin and Civic Center - neighborhoods that may have less clout with City Hall and the SFMTA. If you want to just read about the parking, scroll down a ways. To read the whole article on the geometric analysis of bikeways and parking, read on below. First let's back up for a moment. 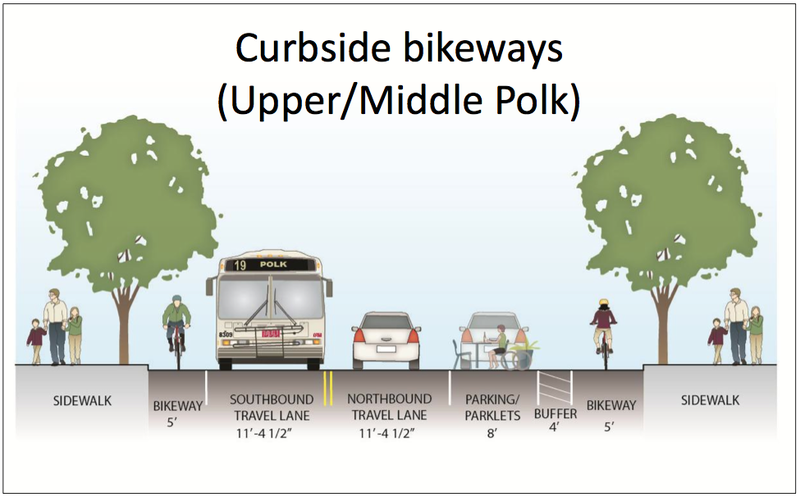 The SFMTA did originally propose an alternative for the length of Polk Street with Curbside Bikeways. 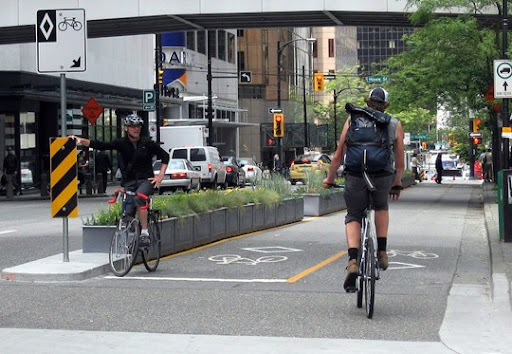 However, the design only had a protected or "buffered" bikeway on one side of the street at a time. The other direction would run along the curb as a classic bike lane. My proposal of a full cycle track on both sides (the Urban Life Signs (ULS) "Complete Cycle Track"), and the SFMTA "Curbside Bikeway" proposal would have removed parking the entire length of one side of the street. Actually, the San Francisco Bike Coalition (SFBC) did propose a "Curbside Bikeway"in its Connecting the City Plan virtually identical SFMTA proposal. The design included a buffered bike lane in one direction, and a standard curbside bike lane (unprotected) in the other direction. Maybe the SFMTA (San Francisco Municipal Transportation Agency) created its "Curbside Bikeway" alternative based on the SFBC proposal. The difference between my "all cycle track" proposal and the SFMTA/SFBC "Curbside Bikeway" proposal is a question of geometry and where to dedicate roadway to auto traffic, bike traffic, and protection zones. Let's look at the two ideas side by side (or rather top to bottom). On top is the Curbside Bikeway proposal, and below is my All Cycle Track proposal. Buffers (or no buffers): the SFMTA has a single 2' 4' painted buffer in one direction, while the Urban Life Signs (ULS) design has a 2' buffer separating parked cars and the bike lane in both directions. 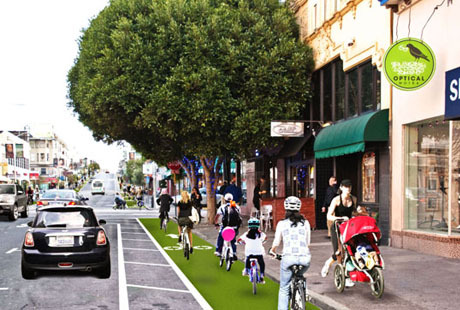 Bike Lanes: the SFMTA created 6' bike lanes, I created 5' bike lanes. I found a new SFMTA diagram with Curbside Bikeways with dimensions, so some of the technical analysis has changed, but the concept differences remain. The fundamental difference here is narrowing the bike lanes from 6' to 5', which gains 2' of wiggle room which I allocated for the second buffer the SFMTA buffer is 4', while my ULS design has spread the buffers to both directions. 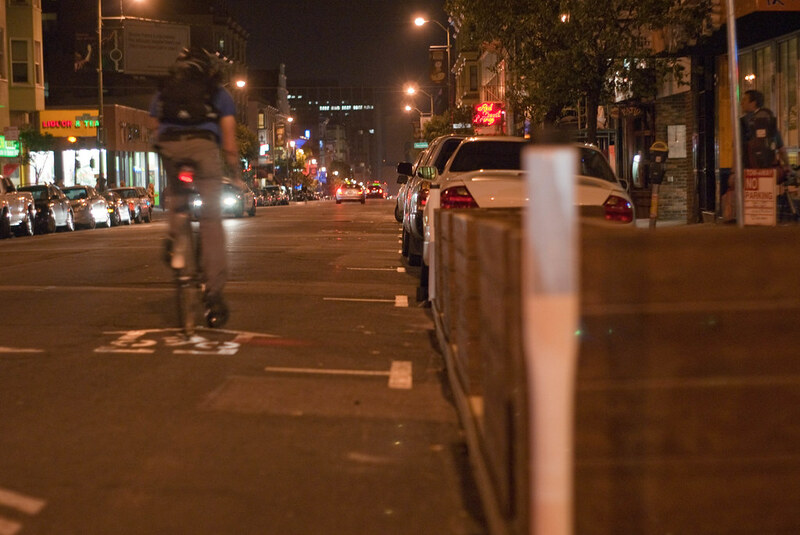 Wouldn't a second buffer of 2' be more beneficial than an extra foot on each bike lane a single 4' buffer? When bike lanes are protected, they do not need any added width to protect for cars opening doors into their lane. The 2' buffer/raised curb creates this zone. There may be a problem with a 2' buffer. Some car doors open wider; up to 4 feet. With a 2' buffer and a 4' open car door, that only gives the bike lane 3 feet of safe clearance. If a 2' buffer is insufficient for protecting most bikers from some opening car doors, then a wider buffer (e.g. 3'), or a wider bike lane should be considered. In our case with Polk Street, taking a 1/2' or 3/4' from the drive lanes and the parking lane and adding them to the buffer would do the job, while still provide sufficient width on the street for buses, delivery trucks and fire engines. Let's try to unpack this. 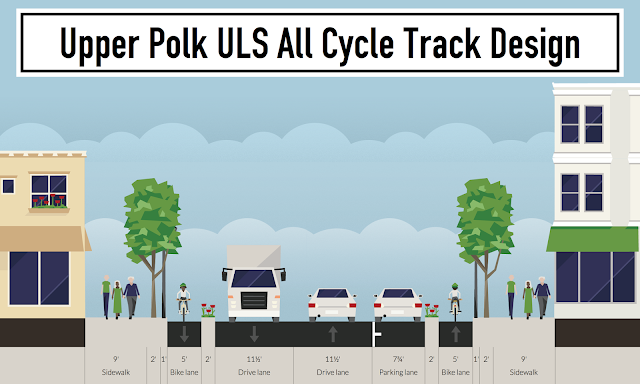 We've seen through the ULS "All Cycle Track" design that the street may not be too narrow. Regarding the intersection treatments, I do not have sufficient information to analyze this, but I do have other street examples. Providing separate signal phasing for bicycles is a good idea. If this means 3-way signaling (a phase each for Polk, cross street, and bikes), then that would definitely slow down Muni operations detrimentally. However, what if it just meant advanced pedestrian signal timing or "Leading Pedestrian Interval" (LPI) - i.e. turning a ped crossing green light 2-5 seconds before the vehicle traffic light turns green in the same direction. The same could be done for the bike lane, having it go green at the same time as crosswalks, but hold vehicular traffic for a few second. San Francisco already has LPI at many intersections, including Mission and 4th Street near the Metreon. 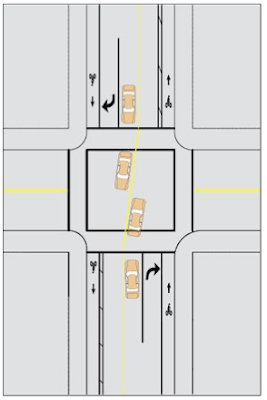 Regarding turn pockets, I only have the image provided in the SFMTA document. The "lateral shift" they describe means that vehicles going straight on Polk would have to slightly "shift laterally" to the right at many intersections. I don't see any problem with this. Shifting traffic at every intersection would slow traffic down and calm the street. Why is this "unacceptable"? Cars aren't going 40 miles per hour here. There's a 25 mph limit, and you often can only go about 20 mph on the street due to traffic. Also note that many streets along Polk Street are one-way, and wouldn't necessarily require a turn lane. In addition, if a street like Vallejo has little traffic, it doesn't really need a special right or left turn lane. This is the case on Valencia Street with its newer 2-lane design at 17th Street. I realize that buses and fire engines would like an 11' clearance. Taking them from 11 1/2' to 11' shouldn't be a problem then. Likewise, parking is traditionally 8' wide. Why isn't 7' wide acceptable? It's true that opening the driver side car door would be a more delicate process in traffic, but is asking parking vehicles to wait for traffic to pass or slow down too much to ensure a all-cycle track design? ...clarify that an unobstructed sidewalk that does not exceed six inches in height will not constitute a per se obstruction of fire apparatus access road. In other words, a sidewalk, or sidewalk extension, or even a raised buffer that is beside a traffic lane can be included in the 20' roadway requirement. 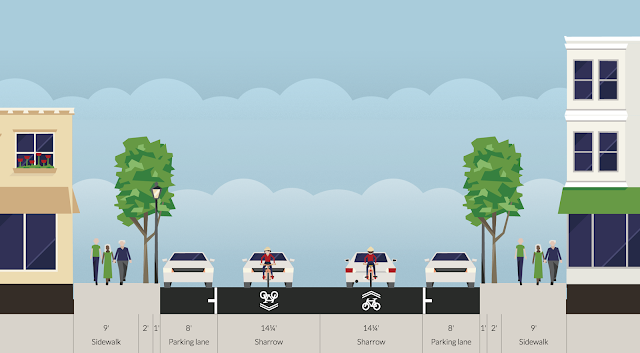 Under this new definition, if traffic lanes are even as low as 9' wide, a bike lane of 5' beside a two-way street can be included as unobstructed roadway. The same goes for a bus bulb that has a cycle track passing behind it. Additionally, fire department vehicles (from tire to tire) are about 8 1/4' wide, and just under 10' 1/2' wide including mirrors. An 11' right-of-way still gives them some room, especially when you consider that when one one engine arrives, there's a 22' roadway. First let's look at what's on Polk Street today, especially between Post and Union streets where it is more constricted geometrically from curb-to-curb. Polk Street is currently configured with 2 parking lanes and two shared vehicle/bike sharrow lanes through its commercial heart from Post Street north to Union Street. 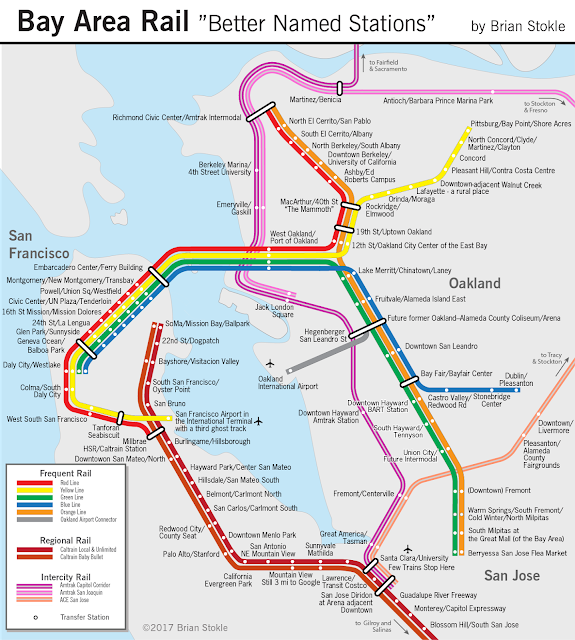 This includes classic Polk Gulch (Geary to California), Nob Hill (California to Broadway), and Russian Hill (Broadway to Union). According to the SFMTA study, there are 240 parking spaces on Polk Street between Union Street and Post Street. I assume this includes general spaces (metered in this case), loading zone spaces (yellow meter and yellow curb), and disabled spaces. I took a survey myself using Google Streetview and counted 235 spaces. I counted 5 motorcycle corrals, which had about 22 motorcycle spaces, so that's likely where the 5 additional spaces are, unless I missed something or Google Streetview is out of date. The street is actually relatively flat from Clay to Jackson so you could pick one side or the other on these two blocks depending on number of parking spaces removed, or other considerations. The other factor affecting Polk Street parking are plans for "daylighting" the street corners so that cars and pedestrians can see each other better, especially for cars to see pedestrians. Daylighting means having an longer red curb zone; for about 20 feet from the street corner, which is the equivalent length of a parking space. As outlined in the plans, this will often mean removing one parking spot on Polk at each street corner (i.e. 4 spaces per intersection). In some cases fewer spaces might be removed due to fire hydrant's or bus stops already providing daylighting. I found that using one of the three methods (one side, uphill side, strategic) somewhere between 90 and 140 spaces (53-60%) would be removed between Post Street and Union Street. When other area streets within a block of Polk are considered, only 10-11% of on-street area parking is removed. Not so much, right? As shown in the table below, if we use the Preferred Design segments of Union to California (Upper Polk) and California to McAllister (Middle/Lower Polk), we find that an all cycle track design would remove about 53% of Upper Polk spaces while the SFMTA design only removes 10%. In Middle/Lower Polk both the SFMTA and Urban Life Signs designs reduce about 50% of parking. 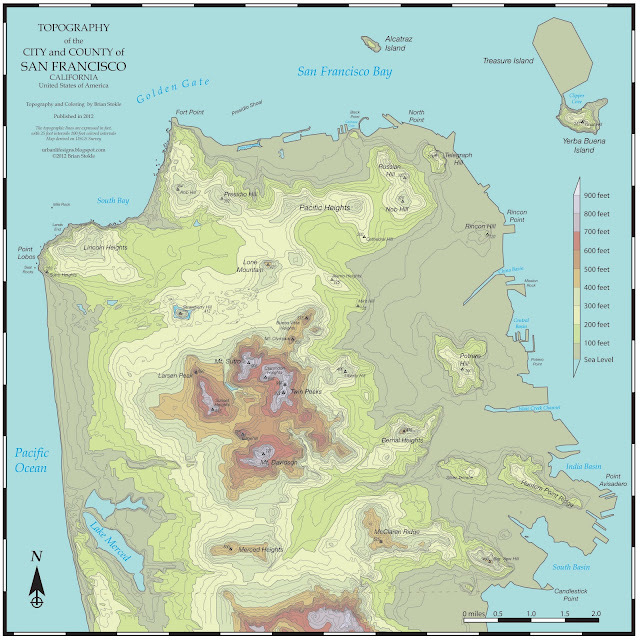 Why is the SFMTA preferred design only removing 10% of spaces north of California, but 50% south of California. It cannot be due to the roadway width (curb-to-curb) because Polk is 44 3/4 feet wide north of California AND south to Post. It's true that the street widens to 48 3/4 feet south of Post, but this doesn't explain the differences in parking reduction. Does this mean that the transit stops and commercial loading are truly different north of California? I don't honestly know, but I imagine that the transit stop characteristics are nearly the same north and south of California. Is commercial loading different? The street is equally commercial with small shops, bars and restaurants north and south of California. Loading for a small upscale restaurant or retail store or a modest burger joint or clothing store can't be that different. "The narrow roadway on Upper Polk does not fit two separated bike lanes and other necessary street uses such as transit stops and commercial loading." Still, a sixty percent reduction in parking is a major reduction, but that can be reduced by reconfiguring some side street parking, and regularizing the bus stops. A bus stop is about as long as three parking spaces. By repositioning some bus stops to increase their speeds, and by removing three bus stops, we can drop the parking change to a 50% reduction in Polk Street parking. And this is exactly what the SFMTA recommends in its preferred proposal south of Broadway. It's only north of Broadway where most of the parking will remain. To many folks, especially merchants, and those that get to Polk Street by driving, that sounds like too much, and I understand that if you must drive to Polk (if you are a delivery truck, have a disability) this will likely impact you. 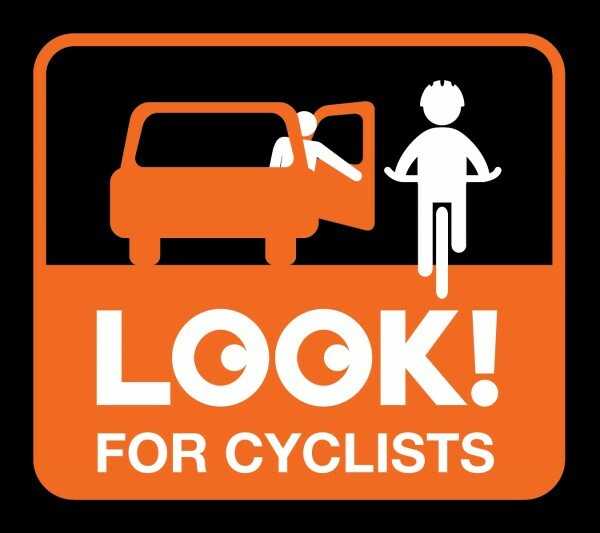 All in all, the current configuration is dramatically impacting pedestrians and cyclists. It is dramatically dangerous to them and discourages them from coming to Polk Street to shop, eat, or visit friends. I would dare say that encouraging more pedestrian access, making cycling attractive to people of all ages, while keeping some parking would be the best formula and increase local business. Regarding design, I had drawn out a cycle track design with a cycle track on each side of the street. In the comments to the previous post, a person suggested creating a two-way cycle track on one side of the street. In theory this could be more efficient because it only requires one buffer between the bike lanes and the parking lane. However, this would mean having the cycle track only on one side of the street. I don't know whether this would encourage or discourage business on that side of the street, or make no difference. That's for a later discussion. Note that North of Union, the street has a bike lane in the southbound (uphill) direction, and sometimes a northbound bike lane. South of Post Street, both sides have bike lanes because the curb-to-curb width is wide enough for bike lanes and vehicle traffic lanes. I've made a revised design of the street, that takes into account the need for a wider buffer between parking and the bike lane. The bike lane next to vehicular traffic can remain narrow, around 2'. Where did I find the space for 2 additional feet? Removing 1 foot from each traffic lane, bringing them down to 10 1/2 feet. Sufficient room for buses (although they'd rather 11), and the street still has 20' of clearance as required by SFFD. (In fact there's 28' of clearance when the buffer and bike lane are included on the left).